Feb. 23, 2008 - We got COAHSI Encore award for our St. Peters Church Concert Series. 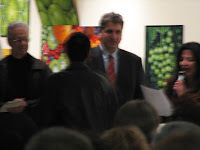 This award ceremony was held at Studio 6, beautiful gallery in Staten Island. Thank you very much for supporting arts! Our upcoming debut CD "Organic Mood" is officially mastered as of last night! Frank Giliberti at Mojo Sound NY did an awesome job - I went into his studio in Long Island yesterday and had a great mastering session. Thanks for waiting everyone, it'll be available to you in no time! Thank you very much for beautiful video! We decided to launch our blog! Our member will contribute some thoughts, cultural topic or event reports. Please stay in tune!